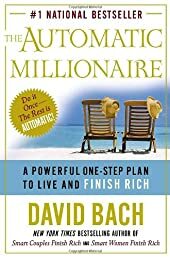 Despite its sensational title, David Bach's The Automatic Millionaire: A Powerful One-Step Plan to Live and Finish Rich is not a get-rich-quick guide. Rather, the book is a straightforward march through common-sense personal financial planning that suggests readers "automate" their contributions to retirement and investment vehicles. Bach, in fact, calls his model the "tortoise approach" to becoming wealthy by retirement age. In the early part of the book Bach builds on ideas he established in Smart Women Finish Rich and other bestselling titles. His core principle is that, to succeed, you must "Pay Yourself First." In other words, he suggests using pre-tax retirement accounts (e.g. 401(k)s or IRAs) to set aside a fixed, monthly sum of money before considering what is left for living expenses. The "automatic" part of the title comes from Bach's emphasis on using automated payroll deductions to avoid the temptation of using the money to pay today's bills. Bach insists that "regardless of the size of your paycheck, you probably already make enough money to become rich." But his claims that his plan requires "no budget, no discipline," is a bit disingenuous. His discussion of the "The Latte Factor" shows that, to find money to start a retirement plan, a person with a modest income needs to make an up-front commitment to stop accruing debt and to reduce spending on such "wasteful" items as lattes and cigarettes. Smart Women Finish Rich: 9 Steps to Achieving Financial Security and Funding Your Dreams (Revised Edit..
Start Late, Finish Rich: A No-Fail Plan for Achieving Financial Freedom at Any Age (Finish Rich Book S..